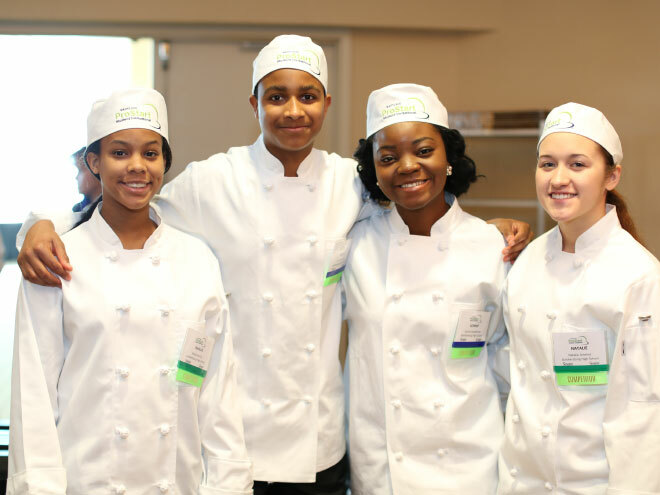 Maryland ProStart® provides high school students with the knowledge, skills, and opportunity to begin their journey towards becoming tomorrow's restaurant and foodservice leaders. Follow Maryland ProStart on social media! ​ProStart® is a nationwide, two-year high school program that unites the classroom and industry to develop the best and brightest talent into tomorrow's restaurant and foodservice leaders. From culinary techniques to management skills, ProStart's industry-driven curriculum provides real-world education and builds practical skills that will last a lifetime. Students learn fundamental culinary and management skills in the classroom. Many university hospitality programs accept ProStart® courses for college credit. Industry professionals mentor students on the job to develop their character and teach real-world career skills. The program capstone is the ProStart National Certificate of Achievement. This certificate is received by students who successfully complete the Level One and Level Two exams, 400 hours of work experience, and demonstrate proficiency on over 50 workplace competencies. Certificate of Achievement recipients are eligible to earn special scholarships and college credit. In 2015, Russell competed in the Maryland ProStart Student Invitational on the culinary team for Northeast High School. Guided by veteran ProStart teacher, Lenore Martin, they won 1st place that year. Russell and his teammates went on to represent Maryland at the National ProStart Invitational in Disneyland, California. Watch as his mother tells his story. Student resources include resume and interview tips, scholarship information, and more. Teacher resources include course materials, important dates, Maryland ProStart Student Invitational (MPSI) information, and continuing education workshops. ​Restaurant and hospitality professionals in Maryland support the program through mentoring, classroom visits, field trips, fundraising, donations, and more.